From paper and textiles, to stone and metal, AP Lazer machines can be used on nearly any material, but one of our favorites to work with is wood. It’s a renewable, biodegradable, timeless, and universal material that’s downright gorgeous in its own right. When spruced up with etched illustrations or custom cut into a unique pattern, wood becomes even more instinctively beautiful and endlessly versatile. Searching for inspiration, we found the following artists and makers who are doing some pretty incredible things with their laser machines and our favorite material. Cutting and gluing layer upon layer upon layer of designs from wood, Gabriel Schama (with the help of his laser cutter, Elsie) creates mesmerizing three-dimensional artworks. Ranging from entirely abstract, organic shapes to his more recent portraiture work, Schama utilizes the laser cutter not just to make his process faster or easier, but to open up his full range of ability. Although he creates his art with the help of a machine, Schama’s technique is inherently handcrafted. Utilizing laser precision, Ron Macken of Lightwave Laser is able to create custom designs and exclusive company patterns from wood that an ordinary contractor simply couldn’t execute. Coming from a background on the engineering side of laser technology, Macken’s artistic pursuits have seen various applications in commercial businesses, as well as private homes. Hotels, restaurants, bars, retail stores, and even a mosque, sport Lightwave Laser panels as wall dividers, external and internal wall decorations, doors, and lighting fixtures. 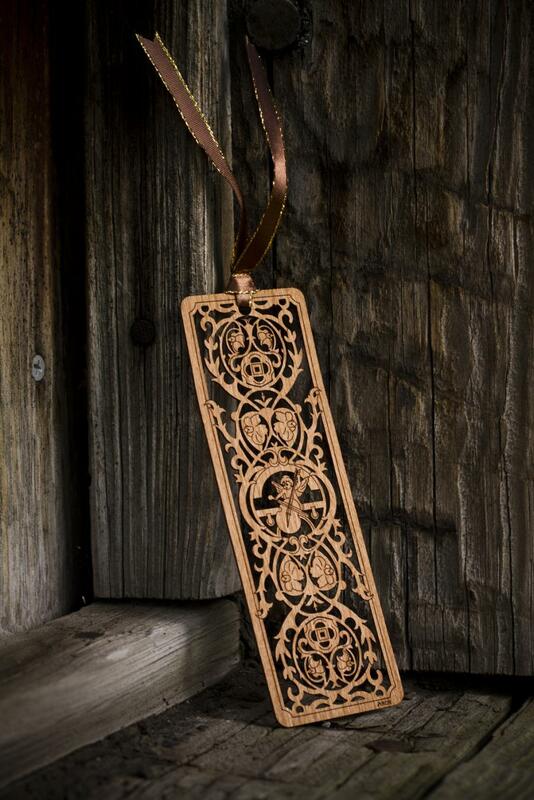 On a significantly smaller scale, Rogue Journals creates laser cut wooden bookmarks that are just as detailed as Schama’s and Lightwave’s large-scale pieces. These delicate creations use wood’s ability to be both smoothly cut and engraved to portray full scenes within a mere 5″ x 1.25″ area. Again, these complex works simply could not exist without the innovation of laser technology. Big Secret is one secret that every laser fan should know. The laser and design company provides assistance at any stage of the making process – in their own words – “from design and development to fabrication and finishing.” Their website and Instagram are full of mind-blowing, award-winning collaborations, as well as some of their own in-house creations. The above baseball bat, designed by Kevin Cantrell and Juan Carlos Pagan, is just one of their beautiful collaborative works. Stay Gold Co makes tattoo art inspired t-shirts, stickers, phone cases, and plug style earrings. Their products are only available for limited time periods, but they currently have 13 beautiful, laser-etched, wooden earring designs for sale. These Super Flower Plugs are by far the most intricate. This pair of earrings – available as small as 12 mm in diameter – highlights a laser machine’s ability to create incredibly detailed texture, with some seriously impressive, minuscule carved portions. This one might look familiar to our fellow Michiganders. Mixed media artist Anila Quayyum Agha swept away the competition with this 2014 Art Prize winner, Intersections. If you experienced this work in person, then you know the feeling of amazement over how such a simple construction, perfectly executed, entirely transformed the space. In fact, the work was so stunning, it inspired a somewhat impromptu marriage proposal. Agha’s still creating sophisticated patterns with laser machines, now opting for steel or paper, but this original piece was made from wood. 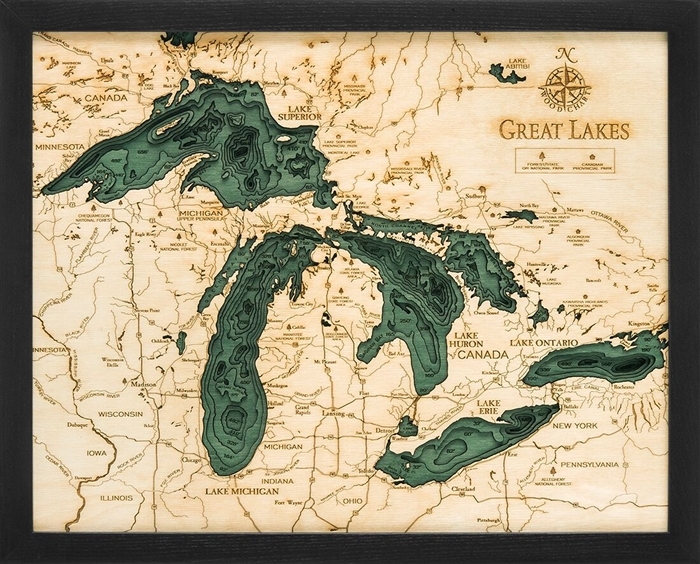 With another series that’s probably familiar if you’re from Michigan, Carved Lake Art creates striking 3D nautical maps. Their collections span the Great Lakes, a variety of states’ inland lakes, Atlantic and Pacific coasts, and some international waters. The works are made by stacking up to 8 layers of laser cut Baltic Birch – which seems to be the ideal choice of plywood for laser machines. The layers are also engraved with topographical details, again demonstrating wood’s particular ability to be both cut and engraved in beautiful detail. Illustrating his love for sci-fi and pop culture, and known only by the mysterious moniker, SpaceWolf is an illustrator, printmaker, and woodworker who creates extremely limited edition wooden posters. With his absolute mastery of the laser machine, he pulls off the most impeccably smooth shading we’ve ever seen. Often based off movies, TV shows, or books, by using cherry wood as his material of choice, SpaceWolf’s work redefines the idea of what a poster is. If you’re concerned about whether or not these posters are actually more or less environmentally conscious than paper, rest assured in knowing that SpaceWolf personally plants a tree for every single poster sold. Mike Wilson of Dragon Powered is another engineer-turned-laser-artist. He has a small selection of jewelry boxes, lamps, and keychains – all made of birch – that are available for direct purchase through his site. But the really exciting stuff is in the blog section. That’s where we found posts like how to make the wooden hinges pictured above and using a custom jig to cut at an angle other than 90 degrees. His video tutorials aren’t particularly detailed and he doesn’t provide any templates, but there’s enough guidance to get a resourceful woodworker started. Husband and wife duo Nathan and Sarah Jones combined their respective aerospace engineering and textile art and design backgrounds to create Beam Designs. Their website and Etsy shop offer a variety of laser cut bamboo goods, such as earrings, key chains, and wall clocks, like this wooden gear design. They intentionally chose Moso Bamboo, which is native to Britain and sourced from their local sawmill, for all of their products because of how well it compliments their environmentally conscious ethics. Obrary (short for open library) is a maker’s new best friend. If you operate a commercial laser service, you might like their Shopping Configurator software, which helps customers see dynamic mock ups of their personalized product so they can be assured their order will be accurate. If you just like to make things, you’ll enjoy their selection of 100+ free design templates and video tutorials gathered from across the Internet. These tutorials focus on laser cutting wood to make items like a working microscope, lamp, or padlock, to name a few. Our favorites of the designs they’ve collected utilize living hinges – laser cut Baltic Birch (yes, it has to be Baltic Birch) that allows the wood to become extremely flexible. The Alex chair above, designed by Alex Zhang, uses a living hinge to create a seat and back from a single piece of wood. Thanks for making awesome stuff!